Promoting affiliate products can be a fast way to start generating your first $5000 online. Also affiliate marketing can be a reliable source of extra income on top of an already successful business. Tune in as James gives an overview of how you can get started, and take a direct path to being successful, as an affiliate marketer. 01:23 – What is affiliate marketing? 08:01 – What gets you the best yield? James Schramko here. Welcome to SuperFastBusiness.com. In this episode, I’m going to talk about how you might get some extra income by promoting an affiliate program. So in SuperFastBusiness membership, I have created some courses before. One is called Affiliate Pounce. It talks about making affiliate income from supporting a launch that’s going on. I’ve also in a recent training talked about how you might get affiliate income from competing in a competition. And in past trainings, I’ve also talked about where you might promote affiliate products for best results, some of the special things that I’ve had in place that make good commission. So what I’m going to do is group a few ideas together in this podcast and just help you out if you’re getting started down the path of promoting affiliate products for commission. Firstly, I should probably just mention what affiliate marketing is. It’s simply you being a commission-only sales representative for another company. So there are sorts of platforms like Clickbank, Commission Junction, and several others, JVZoo, where you could see a product for sale, join their affiliate program, and then promote that product and get a commission. You can even actually do it with Amazon.com. So here are some things that might help you. Now what I’m going to share with you today works best or better if you have an existing email list and any kind of platform to promote things to people, whether it’s your own blog, whether it’s a Facebook group or presence. The core idea will be to send out affiliate offers or to promote affiliate offers ideally that will have a subscription reward option, i.e., you’ll keep getting paid over and over again. A lot of things like software as a service do this. So there are options out there. It will boost your income so that you can create additional revenue for the exact same customer that you’ve got. So if you already have products or services, adding an affiliate revenue stream is a smart idea. If you’re just starting out and you have nothing in play, then becoming an affiliate is a simple step forward to earning an extra income because you don’t have to create the sales page, you don’t have to set up the shopping cart, you don’t have to have a merchant facility, you don’t have to have JV partners of your own, you don’t have to buy paid traffic for your offer and test it and do all the conversions, etc. Your main job is to stick a link for a product or service that solves somebody’s problem right in front of that person so that you can help them out. That’s pretty much what it is. My first $100,000 online came from promoting website software as an affiliate, and I was really helping out people who had the same problem that I had had, which was they were trying to build a website but struggling. So I found this software that did the job. I got to share this software with other people, and when they purchased, I made a commission. In fact, my whole online empire pretty much started with a $49.25 commission, which I was able to then sell more and more and more of. So over 10 years, you might be thinking, what could I tell you in the short version of what your first steps would be for an affiliate program. I’m not going to get bogged down with marketplaces and platforms and offer selection. I’m going to leave some of that to you. But start with who your audience is and what problems they have. If you can start with the market, then you can fit a product to them. Often, people will try and start with a product and then fit the market. But that’s hard. If you’ve already got an existing market, go for that. What is something that you have already purchased or all of your customers have purchased or are likely to purchase? That’s a good starting point. So when you find your offer, you want to check the terms and conditions of the program and see what’s allowed and what’s not allowed because quite often, you’ll see that they’d ban you from using trademarked keywords in search engines, in meta descriptions, or in Google AdWords for example, they might not let you bid on their exact name. So these are things you want to know so that you don’t break the rules. I’ve had situations where affiliate programs have stopped me from promoting their products because I might have crossed one of the lines that they have set. So please read the terms and conditions. The next thing is to make sure that whenever you get an affiliate link, which they’ll provide you, you should redirect it. I always redirect affiliate links because often, the program will change platforms or the vendor will change something to do with the program, and you can’t go back and change links if you’ve put them in a PDF document, which I’ll talk about in a little bit, or if you’ve put them all over your websites, you can’t just go back and change them easily. But if you have used a redirect that you can change, then you can go back and change it at the source and then it will automatically change for anywhere else where that link appears. So there’s a few ways to do this. One, I use a program called Yourls.org. That allows you to have your own link tracker on your own domain. So you simply buy a domain, you set this software up on your host, and now you have your own link tracking software. Now, why wouldn’t you use Bitly or Google? Well, a lot of email providers will firstly block things like Bitly; and secondly, these things are publicly trackable. You could look up a Bitly link and see how many clicks it gets. That’s not something I’m willing to share with people. One of the things that affiliate programs tend to do if you start driving a lot of sales is they want to know where you’re getting your traffic from. So having at least one step to shield that traffic source is a good idea. But most importantly, you’re able to change the link. What if the product you’re selling goes out of business? Well, you can easily substitute it for something else if you want, or you can put up a message on a page, explaining why that offer is no longer available and then let people choose a new link. So it’s vital that you always redirect your link. Other things you could do: buy a dedicated domain name. So for my hosting recommendations, a long time ago, I bought a domain name called clickhereforhosting.com. Go ahead and click on that and see what happens. But that link will redirect to my hosting supplier of choice, and it’s a trackable affiliate link. So using a dedicated URL or hyperlink is an easy way for people to remember it. It’s also good if you want to call it out on a podcast. People can remember it and type it into their browser. So if you’re using radio or if you’re using any medium that’s audio, you might consider an easy-to-remember website address. You could easily buy that for about $9, a company like Namecheap, and then you can redirect your host record to the affiliate link. So when people click on it, it’ll just go straight through. Now, the next thing you want to do is login to your affiliate portal or whatever system they’ve given you to track your links, and make sure that your links are tracking. Quite often, you’ll send traffic to an offer and it hasn’t recorded you as the referrer and you won’t get the commission. So make sure that whatever you’ve set up for your redirect actually sends through all of the variables that are attached to the end of the domain. It’ll have your affiliate ID in most cases, and make sure that it’s tracking to you and that you will be tagged as the referrer. The next thing to do is perhaps try a few different offers to see what gets you the best yield. When I’m doing this, I’m looking for a minimum conversion of one sale per 300 visits. So if I’m not making a sale in 300 visits, that means that I’ve got the wrong message-to-market match or the offer just doesn’t convert. So I want to change something because if I keep sending traffic to a dead offer, it’s not helping me and it’s not helping the person who I’m referring to the offer. What I would like to see is I’d like to see two or three sales per 100 as a minimum. But the absolute minimum is one sale per 300 visits. That means your offer doesn’t even convert at a third of a percent and that’s just not good enough. It’s important if you are making an income from commissions that you disclose this. I have an income disclaimer on my affiliate section of my website where I talk about the fact that I earn a commission if people click on links and buy something. That’s really important to make this obvious to people so that you are not going to be accused of being misleading or deceptive, and people know what your agenda is. It’s OK to promote products for commission. There’s nothing dirty about it. It’s a way of life. In business, there’s all sorts of affiliates and companies who make a commission for selling things. Even your local car dealer is probably a franchise selling a manufacturer’s product for a commission, and that’s fine. Avoid using the cut and paste templates that are supplied by the vendor as it’s not really differentiating you or adding any extra value over what any other affiliate can do. Often, these emails will be flagged as blocked item in the spam filters. If enough people are not enjoying that content, they might click the spam button and then your email will start to be viewed as spam as well. So differentiate. Reword things in your own position. Talk about why you liked the product, what other things are out there, and why you still chose this one, and why of all the things that you could promote, this one’s the one that’s going to solve the problem. Differentiate. Put your own story into it, and use emotion. And of course this is obvious, but only ever promote good things because your customer’s trust is everything. Don’t promote something just because you’re going to win a car, or a motorbike, or a surfboard or whatever. It’s got to be a good product, otherwise, you are doing yourself reputation harm. So where else do you promote your affiliate links now that you’ve got the basics down? Well, I like to have premium content like high level interviews, special resources. My interview series with Clay Collins yielded me a great audience and helped me sell his product because I was able to access a lot of the people that he was accessing, who were interested in finding out more about his story. And then they’ll click through on a link that I have for his product. So that’s a really good way to promote things by getting access to the author or an expert. This even happens in large companies. You can ask large companies if they have a representative or someone in charge, either a technical person or a marketing person, who might be willing to share some insights to your audience. Now of course this is easier if you have a show, or a podcast, or a blog, or a platform, or some kind of soapbox that’s in their interest. And often, if you ask the affiliate manager what else they can do or what other resources they have, they’ll actually share it with you. And another good tip here is to ask them, what are the top affiliates doing? Where do the top affiliates make their sales? What sort of advice do they have for you to make more sales? Because they want to make sales and you want to make sales. 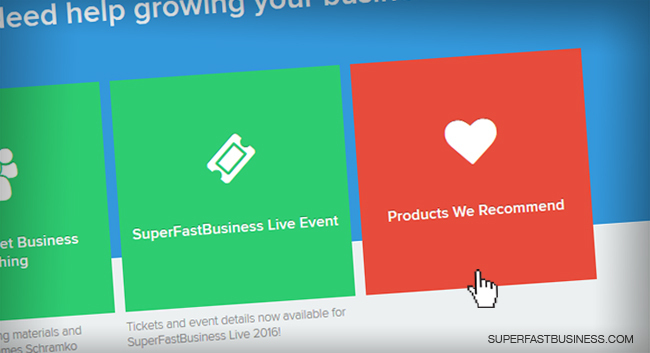 What I did at SuperFastBusiness is add a recommended page to my site, where I simply put: here are the products that we recommend. And I also put a special page of all the tools we use in our business, and some of those links have affiliate links, and some of them don’t. I also put a navigation link so that people can navigate to the recommended tools. Ensure that you always have a very clear and compelling call to action so whenever you’re writing about the product and how it solves the problem, have that clear call to action that is so obvious your customer knows exactly what they’re supposed to do. It could actually say, “Click here to start enjoying blah, blah, blah,” whatever the outcome or result of the product is. Or it could simply be, “Click here to learn more about such-and-such software.” Obviously replace such-and-such with the name of the software that you’re looking to promote. Now if you mention the software on your site, it might also start to attract search results. So it’s really good to have comparisons. It’s good to have questions and answers because people looking to buy something or in that research window will often compare products, they’ll also look for reviews. So using words like review, using comparisons where you compare several leading products in a market with a comparison chart, and you could even have multiple affiliate links could actually get you more sales. One thing that I found really handy is to put a little P.S. link or to use the footer section of my emails to generate sales. For example, when I send out broadcast emails, I have a little link in my email that says, “This email was sent using Ontraport.” That little link can actually be clicked on by people and it will tag them with an interest in that product and follow them up with an email sequence. So that’s one that I use to make lots of sales of email software, and it’s highly relevant because I got a call to action in an email. So someone wondering what email system I use, and I’m sure a lot of marketers do, can click on that link and find out more. Now, another great thing to do is create PDF reports with some good, helpful content, some descriptions, some cheat sheets, some top tips, a FAQs-type guide, anything that supplements the product will be really, really good. And you can put high value content and then distribute it. You want to get that PDF out there. Give it away, use it as an opt-in perhaps, and do whatever you can to get that into someone’s computer so that they can review it and then click through on the links, which of course will redirect to your affiliate link. Now the final thing is create a bonus. Get an incentive of some kind. I’m not talking about discounts, or rebates, or an iPad or whatever. That stuff is a little bit boring. Instead, something that creates additional value. When it came down to my website software affiliate promotions, the thing that I use to create enormous value was to actually help people get way better results when they use the software. I started with this little cheat sheet that turned into this really big PDF document, that turned into a membership, that eventually turned into SuperFastBusiness membership through a series of years. So that initial bonus turned into one of my most profitable business models over time. So I hope you’ve enjoyed this quick overview on how you can get started as an affiliate marketer. If you’ve got any more questions about it, I’m happy to answer as many as you can ask me inside SuperFastBusiness membership. I look forward to catching up with you on a future episode.